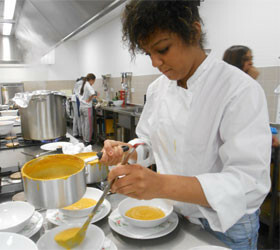 Kitchen Craft is a Catering training facility for 14-16 year olds in Slough and the surrounding area. It is designed to provide a platform for learners who see themselves pursuing careers in the Hospitality and Catering industries. With a varied choice of qualifications to choose from, we offer the opportunity to gain qualifications to progress to college, university or an apprenticeship with advanced levels of skill and knowledge. You will be taught in a professional kitchen by staff who have industrial experience and who are motivated to share with you their skills and expertise. This is a practical and theory based qualification that covers health and safety, team work, meat, poultry, fish and vegetables during the first year. The second year there are eleven food units covering sauces, pasta, pastry and desserts. Learners will be assessed throughout the year on their quality of work in and out of the kitchen. Be able to plan a nutritious, home cooked meal using basic ingredients. Be able to prepare, cook and present a nutritious meal using basic ingredients. Understand how to cook economically at home. This qualification has been designed to reflect the skills, knowledge and understanding that are required in the modern hospitality industry. Introduction into the Hospitality Industry. Customer service in the Hospitality Industry. This qualification is assessed through theory and practical assignments based on professional practices and techniques. pursuing careers in the Hospitality and Catering industries. college, university or an apprenticeship withadvanced levels of skill and knowledge. Think you can be a chef? Want to learn how to plan and cook a three course meal or just want to get started on your cooking skills? Then this is for you.